The whole Ozone team have followed Ruben since the early beginnings of his Kiting career and have admired his dedication and commitment to growing the sport. Our paths have crossed several times and we are now stoked to have Ruben officially become part of the Ozone team. Renowned for pushing the more extreme side of Kitesurfing his whole ethos resonates with being driven by the elements, consistently being inspired by nature’s most brutal conditions. 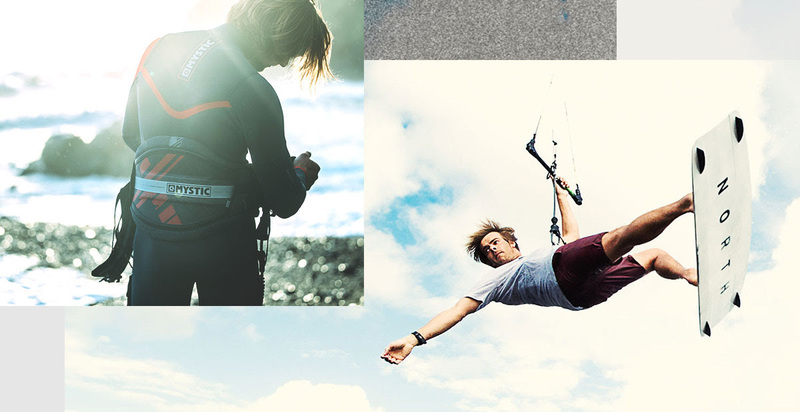 North Technology Group (NTG) has today announced it will make a further significant investment in its watersports business - proudly announcing the combination of Mystic B.V with North Kiteboarding under a new part of NTG called - North Actionsports Group. The new Manera Eclipse harness has joined their very popular Exo range. Manera Eclipse is not a hard-shell harness per se. They call it the "adaptive shell" that's still super stiff but gives a bit to match rider's body shape. Which is a great idea actually. It's stiffer towards the centre and more flexible on the edges so it doesn't cut into your body when riding. We've asked Michael Birt, UK Kitesurfing Champion 2000, Airush and Shinn distributor in the UK, for an interview after his epic 20m+ jump. I hope you enjoy his reading his answers as much as I did! The Mystic Majestic 5/3 Front Zip is one of the world's best selling winer wetsuit. A combined flexibility and warmth of the M-Flex 2.0 neoprene makes it a perfect choice for cold European waters. At Skymonster we do our best to test as many products we sell as possible. Here are our thoughts on the 2018 edition of Mystic's leading winter kitesurfing wetsuit.